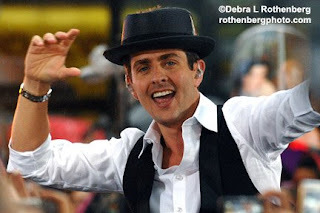 POURING rain didn't keep away over 20 photographers and an incredibly large crowd at Rockefeller Plaza for the triumph return of The New Kids on the Block-Donnie Walhberg, Jordan Knight, jonathan Knight, Joey McIntyre and Danny Wood. Their fans are older (and many were old!) but everyone seemed to have an amazing time, despite the horrible weather.